(Ottawa, Ont.) 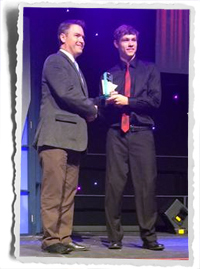 Wheelchair Basketball Canada would like to congratulate senior men’s national team member, Liam Hickey, on being named the 2014 Male Youth Athlete of the Year by the city of Mount Pearl, N.L. Recently named Wheelchair Basketball Canada’s 2015 Junior Athlete of the Year, Liam is one of the youngest players ever to earn a roster spot on the Canadian senior men’s national team. The Mount Pearl native was a key fixture in Prince Edward Island’s best-ever fourth place finish at the 2015 Canada Winter Games. Liam will look to add to his on-court accolades this summer as he is a hopeful to represent Team Canada at the Toronto 2015 Parapan American Games. Liam is a rising star who has the potential for a bright future within the Canadian wheelchair basketball scene. Congratulations Liam.